A powerful, easy to use spray system wash and rinse at the turn of a switch! The sprayer delivery system draws the Vigor Power Wash™ at a preset dilution ratio for a perfect wash every time. No waste, no mess, less work and safer for the environment.Vigor contains Camphor, Oil Of Sassafras,Oil of Wintergreen, Oil of Cedarwood,Oil of Rosemary, Oil of Thyme & Juniper Oil. 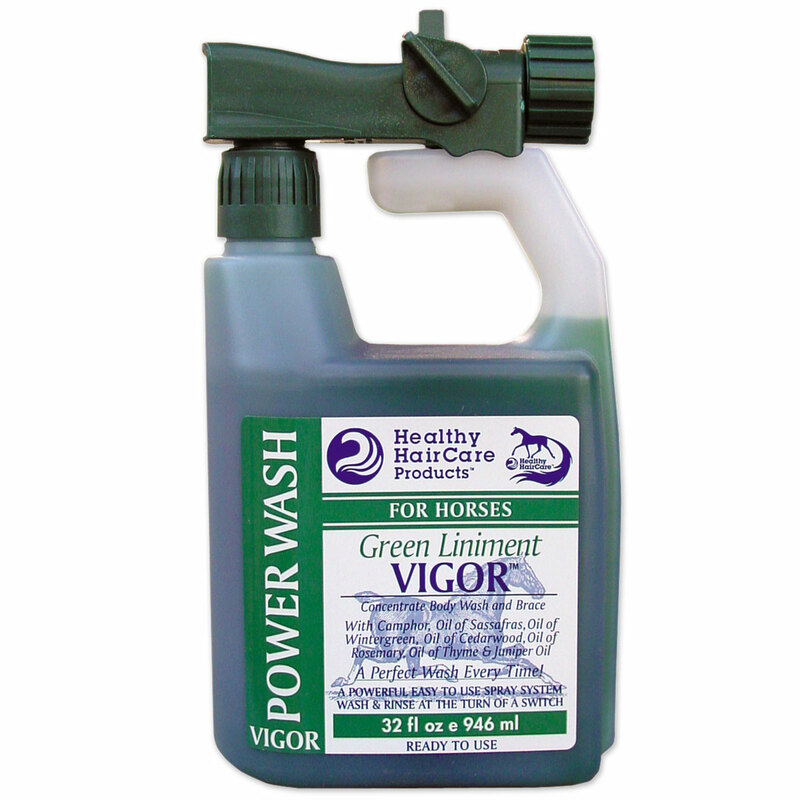 Vigor is great for after exercise, competition and riding. Horses will feel and look great! 8 - 16 Washes Per 32 oz. container. Vigor Power Wash is rated 4.8 out of 5 by 23. Rated 5 out of 5 by JG RN from Horses truly LOVE this!! I bought this product about a month ago - and I always read the reviews before buying a new product - it truly is as good as what was posted about it - my horses relax, luck their lips, and stand so still when using Vigor after workouts - I even take it with me to barrel races and use after each event - they love it - and I can tell it relaxes them! I won’t go without this! It’s a must have! Rated 5 out of 5 by GailB from Smells wonderful! I purchased after seeing how happy my friend and her horse were with this product. The air and her horse smelled wonderful when she would bathe her after riding. The herbal oils seem to provide a great soothing bath. My horse seems to like it also. It is easy to use and I was surprised at just how little it uses for a bath. The convenience of hooking up to a sprayer and not having to dilute shampoo in a bucket is nice also. I spray, leave it on and scrub a little and then rinse. His coat looks shiny and he smells fabulous. Rated 4 out of 5 by Roaniepony from Good product, container needs help I bought this product for myself after using a friends at a show. I love the shampoo, super easy to use, you don't get as wet as the horse, easy to rinse out. My only holdback from giving it a 5 is the packaging. Where it connects to the hose it constantly loosens up and starts spraying all over. Once you tighten it, its fine. Rated 5 out of 5 by Megaafreshh from Most underrated bath time product This is genius. Smells lovely, lasts forever, also the bottle can be refilled with any wash after it's used up! Rated 4 out of 5 by Cheve from Easy to use, smells great Bought this to use on my horse after a long hot sweaty trail ride here in NC. I feel it relaxes his tired muscles and refreshes his skin. Shampoo comes out great, rinsing water comes out without much pressure, could be better. But that is the sprayer, not the shampoo product. If the water spray had more pressure would have gave it 5 stars. Rated 5 out of 5 by AMercerDDS from Smells so good! I purchased this because I needed to spend $15 for free shipping... What a great find!! Smells so good and does the job! Rated 5 out of 5 by Capriserider from Easy to use and Smells GREAT This is a great wash system. You just hook it up to the hose and spray. I love the way it smells--clean fresh scent!